A 12-Day Guatemala itinerary for adventure seekers. You’ll discover the best places to visit in Guatemala, the best time to travel to Guatemala along with where to stay and what to eat. Written by a local. The itinerary is perfect for those travellers, couples, groups or families with teens looking for some moderate adventure and nature activities. 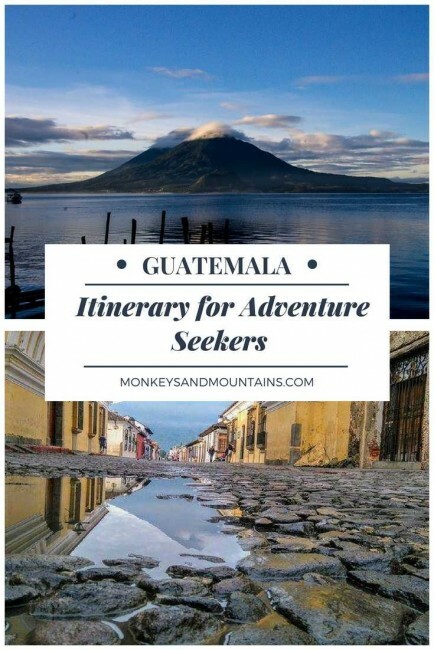 As a Guatemalan who loves being outdoors and has taken the time to go around the country searching for adventure, this is what I would recommend you to do when you visit Guatemala. Fly into Guatemala through La Aurora International Airport in Guatemala City (you can find good flight deals on Skyscanner). Once completed immigration and recovered your luggage, take private transportation to your hotel in Antigua. Insider Travel Tip: When booking your flight try to get one that lands around noon. This way you avoid all of the rush hour traffic and get to Antigua in time to find your hotel, get some dinner and familiarize yourself with where the supermarkets, ATMs and any other services you might need are. View of Agua Volcano from Antigua’s Arc Street. Get up early to get started with your Guatemala itinerary and enjoy the best views of the city. Try to be on the streets no later than 7 am. It’s the time when there are the least cars and people. Plus the first rays of the day provide the best light for photos. Once you’ve taken some time to enjoy the place, start visiting churches, convent ruins, museums, and restaurants. While you won’t find self-guided tours where you get a recording and explore on your own, you can have half-day and full day guided tours. I recommend a tour as a guide will take you to places that you wouldn’t find by yourself and will explain the history. Now that you’ve had a chance to discover Antigua, it’s time to go for an adventure. Pacaya is one of the three active volcanoes as well as the most accessible and the safest for visitors. The easiest way to explore Pacaya is on a guided tour. Alternatively, if you want to do this on your own, get up early and head towards San Vicente de Pacaya Town. There are tons of private shuttles being offered all over Antigua that can take you there any day. When you get to San Vicente, you’ll find the visitor’s center. You’re required to go with a guide so, if you haven’t arranged one at one of the many travel agencies in Antigua, they can help you to get a local one and even a mule ride. The hike up to the volcano only takes about 1 or 1.5 hours. If you’re reasonably fit, you can hike it and won’t need to hire a mule. After hiking partway up the volcano, seeing old lava flows and checking out the active fumaroles which you can roast marshmallows over, head to a place called Santa Teresita Spa & Kawilal Hotel, in the nearby Amatitlán town. You’ll have to have this transfer arranged beforehand since there are no busses, taxis or uber available in this tiny town. This place is awesome. There are naturally heated pools, saunas, jacuzzis, massages, beauty treatments, restaurants and even an artificial indoor beach. By the end of the day, you’ll be relaxed and ready to go to bed. To head back to Antigua the best option is asking the Santa Teresita Spa to arrange a private transfer for you. Remember, however, that you should tell them about your visit and ask for transportation at least a week in advance. Don’t attempt to use public transport for it, aside from dangerous it will take you too long to get back to Antigua. Get up early in the morning because it is time to start the 3-hour drive to the most beautiful Lake of the region. For this, you can take one of the many shuttles leaving Antigua every day. I recommend getting to Panajachel Town (the main town around Atitlán lake) in time for a late breakfast at around 9 am. That way you get the whole day to go on a long hike along as many of the 12 towns of the lake as you want to visit. You can also go on boat tours, rent a kayak and go shopping. Spend the night in the area. If you want to party and enjoy a night of dancing, you should stay in Panajachel. If you’re looking for something more relaxed or private villas, consider San Pedro, Santiago or San Marcos. You’ll find hotels for all different budgets. Here are a few of my recommendations. Traditional Guatemalan Textiles as seen from Chichicastenango Market. You’ll feel the temptation to shop at the markets in Antigua and Atitlán, but you must be strong and wait. That way, by the time you finally get to Chichicastenango you can go crazy in its enormous market. You will find anything in it, from handicrafts and colourful textiles to livestock. While at the market make sure to check out the local church. It was built during colonial times over the ruins of an old Mayan Temple. You’ll be able to see Mayan rituals happening on the stairs and Catholic ones inside. You can go around in Chichicastenango on your own and the market, although massive, is easy to navigate. However, if you’re interested in the history and importance of the market and the church you should get a guide. After exploring this never-ending maze of stalls and vendors grab some lunch and ask your driver to take you to the Guatemalan ruins of Iximche. When you get there, you’ll see that there is nothing too spectacular about the ruins of this old Mayan city. However, it’s a significant place to visit. It was the first ever capital city to be declared by conquerors in Guatemala and Central America. Great battles happened here and the people fought bravely to try to repel invaders. This is where the modern history of the region started. Plus, if you are lucky, you might even be able to see a Mayan religious ritual happening at one of the ancient altars. Finally, make your way back to Antigua to spend the night before exploring the southern coast. Travel tip: To get from Atitlán to Chichicastenango to Iximche and finally to Antigua you will need to have private transport arranged ahead of time. There is public transport that can take you anywhere in the country if you like, but it is not comfortable, or safe. It is also extremely slow. So keep this in mind for the rest of the itinerary. Get up really early, the earlier you can leave the hotel the better, this will allow you to avoid traffic and will let you have more time to relax and explore later. A 5-hour road trip is ahead of you so try not to leave your hotel in Antigua later than 6 am if you want to have enough time for all of the fun. Takalik Abaj is another significant Mayan Archaeological site that will help you understand Guatemala a lot better. This one was around during the earlier days of the Maya. They were fabulous merchants who had a lot of influence from Olmecs and Mayas. That shows in their architecture. The site is also extremely relevant to historians. The amazingly preserved murals, stelae, artwork, and monuments have allowed them to learn a lot about the Mayan culture and their writing. Take your time to explore it and when you’re done, go to your accommodation in either Puerto de San José or El paredón, depending on what you plan to do the following day. If you’re going whale watching you better stay at Puerto de San José. If, on the other hand, you want to go surfing the next day, stay at El Paredón. Both towns are about three hours away from Takalik Abaj. Humpback whale off of the Guatemalan Coasts. Whale watching: Humpback whales pass and hang for a while near the Guatemalan coasts between December and the end of February. To go whale watching, you can take a tour leaving from Marina Pez Vela. They last most of the morning, and some even include lunch. Surfing: If you’re not in the country during whale season you can still enjoy your visit to the southern coast by taking some surf lessons or enjoying its waves if you are already experienced. Bonus: At least three species of endangered sea turtles come to Guatemalan coast for nesting almost year round. So you can take advantage of the visit and arrange to go on a baby turtle releasing tour. By paying for it you’ll help organizations that are working hard to bring back healthy populations of these gorgeous creatures. Most of the time you don’t even have to make a reservation. Just visit a nearby turtle sanctuary and ask when the next visit is going to happen; chances are, there will be one the next day. So do it the afternoon of day 6. Even if you decide to participate in both activities, you’ll still have time to go back to Guatemala City and spend the night there. The transfer from the southern coast to Guatemala city only takes about two hours. View of Semuc Champey from the lookout deck. The journey to Semuc Champey is a long 7-hour drive, so leave your hotel at 5 am. That way you’ll arrive at Semuc Champey around noon. There, you’ll be rewarded with stunning views, and you’ll immediately want to go swimming in the natural pools. Stay in the area at one of the few rustic hotels. This time we are not leaving the region just yet, so you’ll have a little more time to sleep. But be sure to be ready at 8 am because you are going Rafting. Cahabón River still has more to offer. Rafting is a year-round activity, and Cahabón has different sections with different difficulties. A few companies are offering these tours, and they will provide you with all of the necessary equipment. The best part is that this exciting activity will only keep you busy in the morning, leaving you free to explore the gorgeous Lanquin Caves in the afternoon. For this tour, you can ask your hotel to arrange a local guide to take you there and to guide you through the safe parts of the cave. A section of it is illuminated and has marked paths that you can follow if you are not with an experienced guide. However, a specialized spelunker can provide you with the right equipment, allowing you to explore more. Spend the night here, rest well because the next day you’re going on another 5-hour road trip north. After being on the road almost all of the morning, you’ll arrive at a tiny island located in the middle of a lake. This is Flores island, a colourful place filled with restaurants, hotels and small cafes, all lined along narrow streets. Exploring the place will allow you to get settled, relax, get some food and enjoy a nice shower at a better hotel than the rustic ones around Semuc Champey. I would recommend getting a hotel on the island. It’s not very close to the next destination but the sunsets and sunrises are fantastic and restaurants are really varied. On the last day, you’ll actually explore Guatemala’s most beautiful Mayan ruins. A Guatemala itinerary wouldn’t be complete without a visit to Tikal National Park. Tikal is the most popular site in the country, with its stunning monuments that are easily accessible. Tikal has also been of great importance to historians who have been able to gather tons of information from the people that once lived in it. So it is a must visit landmark of Guatemala. It takes one whole day to visit the site and you can get there from Flores in only 1 hour. You will definitely need a guide to learn all about the park and the magnificent ruins. You can book Tikal tours that include transfers from and back to your hotel. Also, I would recommend not going back to Flores. If you can and if you like it, stay for a camp night at Yaxhá. The sunset from there is stunning. Tikal is great but, to be completely honest, its neighbour Yaxhá Park is much more beautiful, with views of the nearby river and most importantly, not crowded. So my recommendation for this last day of adventures in Guatemala is to book a late flight. That way you get the chance to explore the beauty of Yaxhá in the morning hours. You’ll be back at your hotel on time for checkout to pick up your bags and head to the airport. There is an international airport in Peten, the Guatemalan department where Tikal and Yaxhà are located. It is called Mundo Maya in Santa Elena town. So book a return flight that leaves from here. That way you won’t have to spend two more days on the way back to Guatemala city by road. If there aren’t any flights available to your destination, you can also fly back into Guatemala City for a moderate price. Guatemala has two noticeable seasons. 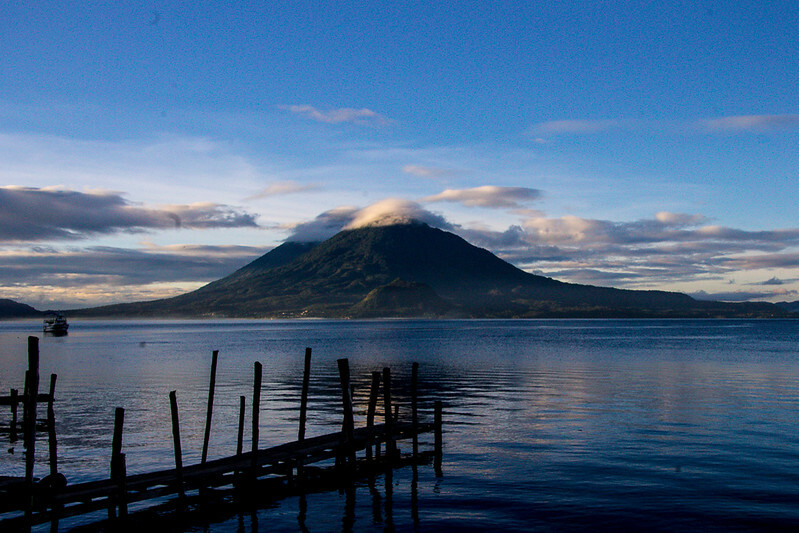 The dry season, between Mid October and Mid May, is the best time to visit Guatemala. During the rainy season, there’s the risk of not being able to do all the activities you would like. The average temperatures range from 32°C – 20°C during the day and 20°C – 8°C at night. There is also a time within the dry season when it gets a bit colder, usually in the months of November, December, and January. There are the best months for a trip to Guatemala because it is when it rains the least and wind keeps the sky clearer, allowing the best views. You won’t find too many variations in Guatemalan traditional food. The local specialties consist mostly of variations of spicy stews, tamales, and elaborated salads. However, each region has its typical dish. The one for Antigua is piloyada, a type of large brown beans salad prepared with a lot of meat and vinegar. The typical dish in Atitlan is called Patín, a mixture of tomato, small fish and pork meat cooked in a green plantain leaf over a fire. On the Pacific Coast, you’ll find pretty much every kind of seafood you can think of. I suggest you taste the seafood soup but there are many dished you can try. In the area around Semuc Champey, which is called Alta Verapaz, Kak’ik is the plate to order. It’s another spicy stew with tons of veggies and turkey meat. The secret to its flavour is the different peppers and sesame seeds used for the broth. North Guatemala doesn’t really have any unique dish, but they prepare pretty much all of the traditional Guatemalan dishes at small eateries. There’s a lot to do and see in the country and this 12-Day Guatemala itinerary only covers some of the best places. If you got a little more time, I suggest you stay longer at the location that interests you more. Or, if you’re looking for a bit more excitement, you could trade Laquin Cave for Caxlampon, Pacaya Volcano for Fuego Volcano, and extend the road trip through the highlands to Huehuetenango in search for beautiful mountains and gorgeous Cenotes. You won’t regret it! 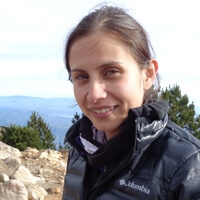 Lourdes is a soon to be lawyer from Guatemala with the mission to explore each corner of the country. Her favorite activity is hiking along with exploring mountains, forests, caves, volcanoes and all that the region has to offer. Her goal is to reach as many summits around the world as she can. You can also find her on facebook, twitter, and instagram. Would love to visit and explore the Chichicastenango Market! It is a really cool place! Don't miss it.